Welcome back from Christmas break everyone. Sorry I took such a long hiatus, but I was busy doing all kinds of stuff around the house. Let me catch you up to speed, “the unthinkable happened”. I went to the city and they said I could NOT build a music studio in my detached garage. WHAT! No way, how could this happen. I didn’t even think this would be an issue. So what did they say you ask… Something about my garage becoming an “habitable space”. Now after much searching on the internet and an email fired off to the city, I’ve yet been able to “clearly” define what “habitable space” even means, and the city has not responded. I have a general idea what habitable space means, but why is it that I can work in my garage shop all day every day and it’s not a problem and NOT considered habitable space. But when I want to put up a wall and insulate the crap out of it, it becomes a problem. Of course my cities meaning of “habitable space” may be different than your cities, but I’d like to hear your feedback on this anyway. I’m not giving up, but it sure was unexpected. So in the mean time until I find out from the city if there are any exceptions to this rule, I’m moving forward. So here’s what I’ve been working on as far as the design goes. 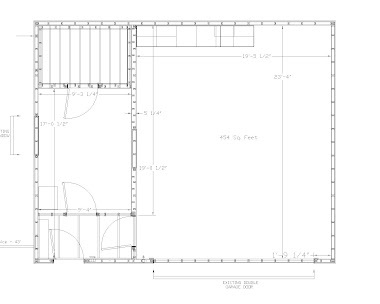 I drafted the plan out (see the drawing) and I put in some furniture and a grand piano (My Daughters) and I quickly discovered there will not be any room in the control room. As you know this is a 2 phase process, phase 1 control room then phase 2 car side for bands. In reality the Control room will be the main room for a year or two. 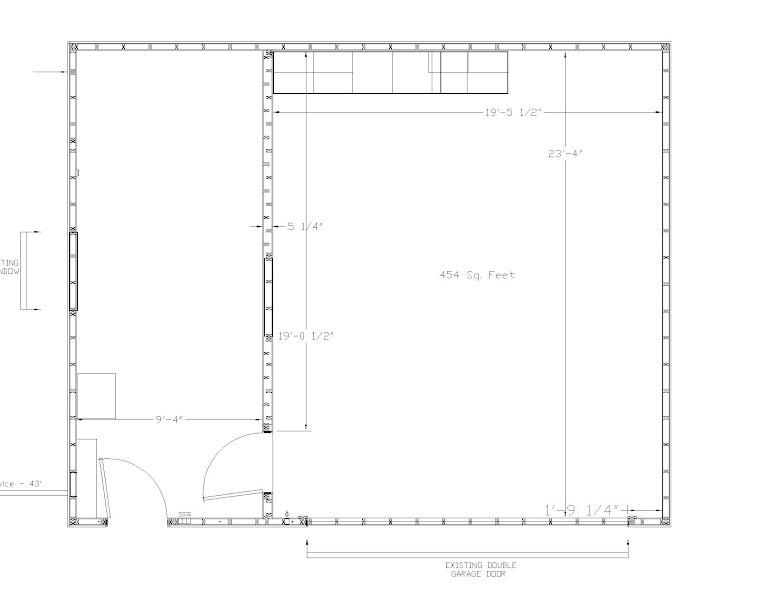 So in the control room will be my control surface desk, grand piano, iso booth and drum kit. See, not enough room. So I decided to see if I could extend my garage 6’ on the left side for a drum booth and an iso booth. I’d even have a big storage closet. Don’t forget, storage is very very important. At the very least have a closet to jam all your extra stuff in, including your gig bags. 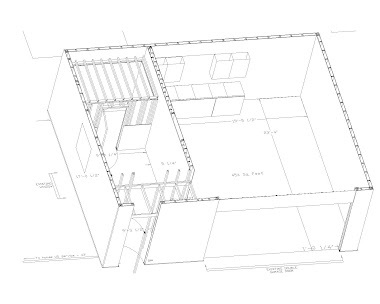 My walls are 10’ so I might be able to get away with keeping the slope of the roof and just extent it down. Heating and cooling are still a concern, but my nephew is an HVAC guy and he and I are going to bang our heads together to see if we can come up with a solution to this. On a side note, I found some cool designs for solar heating that I may at some point add to my garage to help keep heating costs down, but that’s another blog some other day. Some of you are getting ready to advise me to just build it and not tell the city. And some of you may have done or are doing that, but there’s a danger lurking. I won’t go into great detail but to say, if you are robbed or your studio burns down and you build an illegal studio, there’s a good chance you insurance will not cover it. Also, what if someone gets hurt? Will your homeowners insurance cover it? Hmmmmmm. OK, wish me luck with the city, hopefully we can come to some solution that will allow my studio and remain within the code.